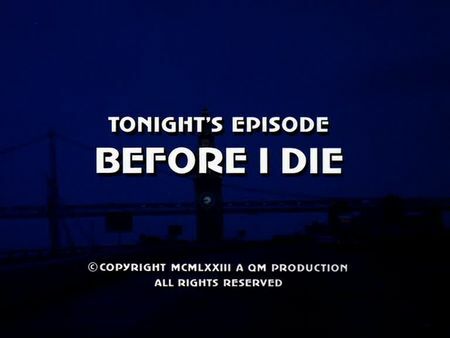 I have just added the screencaps for Before I Die to the episodes' page. John T. Connor, a well-respected police inspector, learns that he is going to die from a massive aortic aneurysm. Following the fatal diagnosis, Connor decides to do mankind a favour and eliminate mob boss Al Royce who has been Connor's quarry for over a year and a half - and seems to be simply unconvictable as he was just cleared due to a lack of insufficient accumulation of evidence. Soon after, Royce's bodyguard is killed, and Connor disappears - allegedly due to an acute illness of his sister in Portland. While homicide is analyzing the latest stakeout film materials on Al Royce, Mike, Steve and Inspector Murray Shindler, Connor's long-time partner, recognize Connor's private car in a short scene. Angry about his partner lying to the whole department - but still unaware of the fatal diagnosis he got - Shindler takes Connor to task. Although Connor does not reveal it in detail, he asks for his partner's understanding for a final mission he has to do on his own. In the meantime, the mob is also out to kill Connor so, on the one hand, homicide has to protect the mobster, and on the other hand, is hurrying to put Connor off from his lethal decision. By the way, this was Leslie Nielsen's second performance in the show, and again it was quite convincing and authentic. This episode's filming locations are reaching from the Embarcadero Freeway to Bay Meadows, and from Potrero Hill to the Financial District. It all starts with the stakeout when Connor and Shindler are following Al Royce's limousine on the Embarcadero Freeway and southbound on Interstate 280. They leave the freeway at the 18th Street exit, cruising eastern Potrero Hill up to well-known Potrero Commons. The following car chase leads us down to Lefty O'Doule bridge and the industrial harbour, where it comes to a sudden end. Mike and Steve pick up Connor and Shindler at the Emergency Entrance of San Francisco General Hospital, and soon after Connor receives his fatal diagnosis in a doctor's office located at One Maritime Plaza. He is shading Al Royce and his entourage at the (then all-new) Transamerica Pyramid, and shoots Royce's bodyguard in front of the 'Graf Zeppelin' restaurant which was located close to Fisherman's Wharf. Mike and Steve are questioning Al Royce on his boat at the Marina Yacht Harbour, and the stakeout of the funeral service takes place at Washington Square (the mobsters are leaving St. Peter and Paul, the stakeout crew is sitting in a surgeon's office on an upper level of 1652 Stockton Street). John T. Connor's house is located almost right around the corner, at 1155 Filbert Street. Additional locations include San Francisco City Hall, Lands' End, the Hyatt Regency's lobby and shopping area, the Embarcadero (when Steve picks up a newspaper in front of Pier 37 (now demolished) in order to check out the horse race bets), and the Bay Meadows horse racing track in San Mateo.